Happy Tuesday everyone!! I wanted to quickly say thank you SO much for all of your support with my clothing line launch yesterday! I’m overwhelmed by the response we had. None of it would be possible without you! 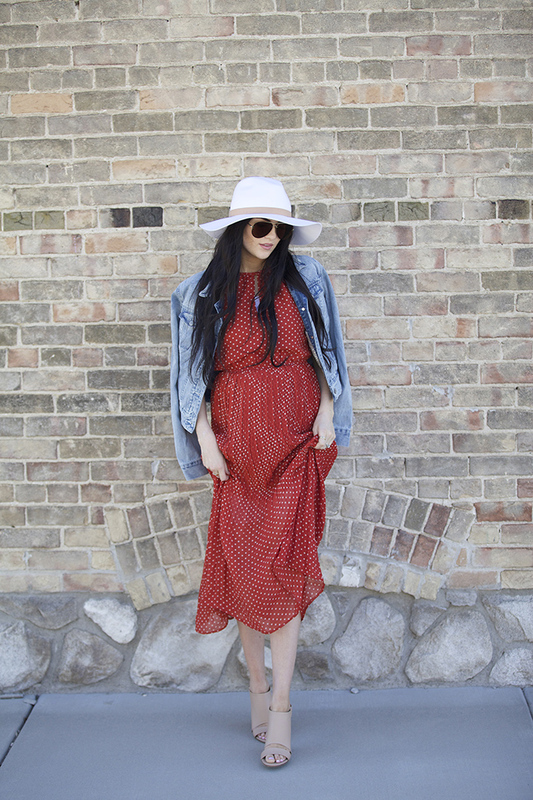 One of my favorite pairings to wear during the spring and summer is a denim jacket and light weight dress. It’s chic yet gives off a relaxed vibe (that’s actually super comfy) and it’s perfect for chasing around my Isla Rose (that girl is on the go!!!). You can totally pair this dress with either wedges, pumps or a cute pair of flat sandals so it can be easily dressed up or down. You can find this dress at Maison Jules from Macy’s and it’s on sale right now!!! I got so many compliments on it the night I wore it and it flattered my bump perfectly, even though it’s not maternity. This dress looks so nice! Beautiful dress! Love the boho vibe! 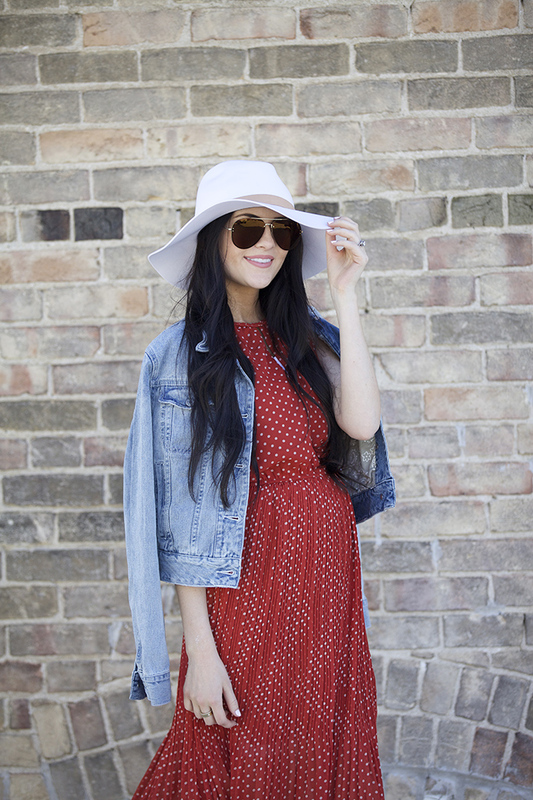 Love the polka-dot dress with a denim jacket. This dress is really lovely! And I am right there with you, I also adore a denim jacket layered over a jacket in the spring… perfect look! Thank you Amber! I will look for the email and get back with you :) Sorry i haven’t replied yet, yesterday was a crazy day with the launch! Super cute dress! Love it! Congrats on your line, it’s gorgeous :) will you be restocking sizes? i was hoping to snag the ‘everyday dress’ in an XS but it sold out before i had the chance! thanks! Hi Meg! Yes, we are hoping to be able to restock sizes :) Stay tuned! Such a cute dress. I love it with the wedges. Love this dress and the fact that is it currently on sale!! Thanks for sharing Rach. 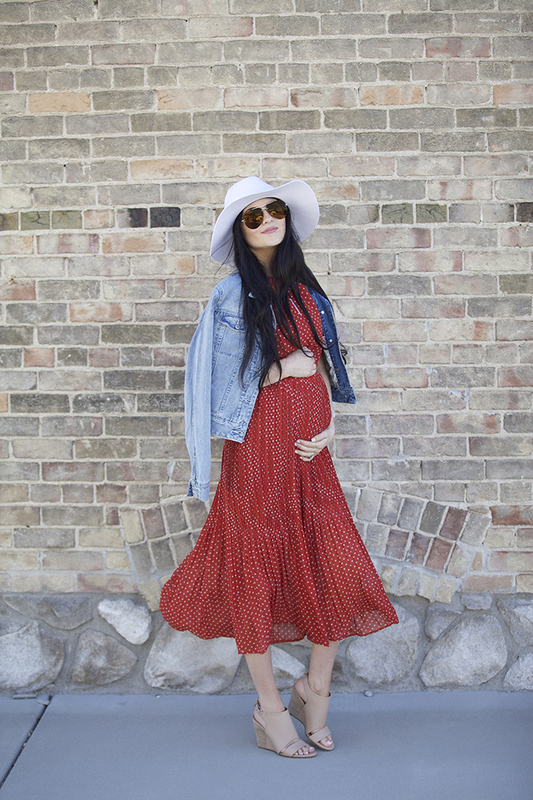 This dress is seriously so cute…love this look on you! Loving this little dress on you! Omg obsessed with this dress and those sunnies! Love this gorgeous dress!! Love those sandals too! Red is definitely your color! I love the denim jacket with that dress! Thanks Jamie!!! I’m loving red lately. Wow, such a cool dress! Love this dress…that color is beautiful! I love those shoes rach! Congrats again on the line that is such an amazing accomplishment!! Love this dress – the polka dots are so cute! I ordered one of your new clothing items and I am so excited to get it in the mail! Love this dress! So excited for you! Such a pretty dress! 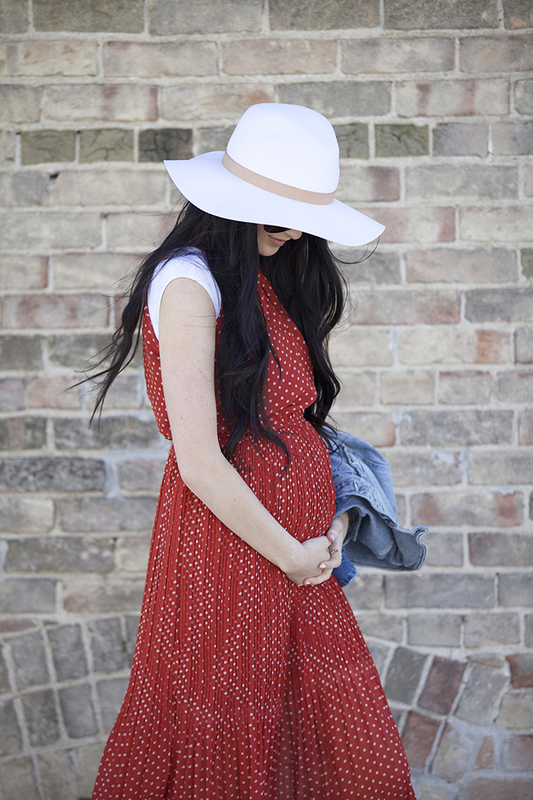 I love the red and the white dots, so cute and perfect for spring and summer! You look adorable, love your dress! Congrats again on your new clothing line – so exciting!!!! You are so sweet, thank you Sarah! Congrats on baby number 2 !! 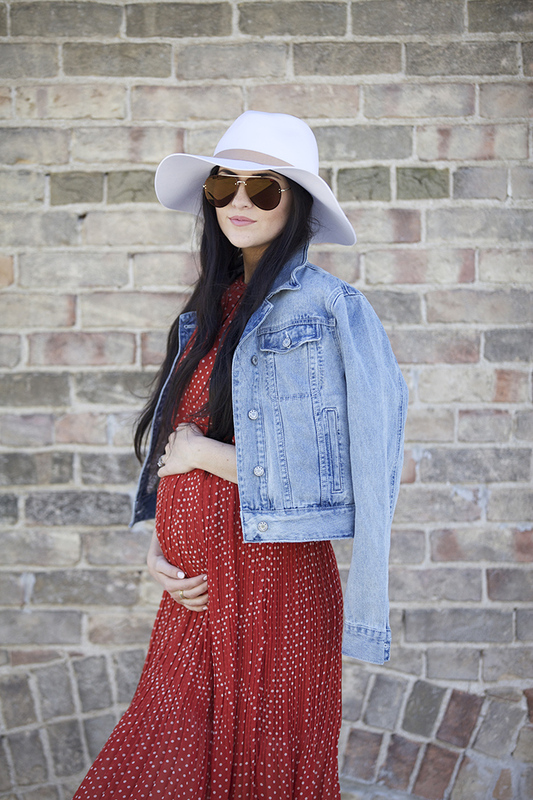 Jean jackets really are the perfect sprint addition! Loving this bump look. Beautiful dress and it looks stunning on you! What a great dress! And it looks so cute with those little white sleeves! This is such a cute look! I love your hat and the dress is so perfect on you!! Very beautiful dress. I loved it !! !